Afghan security members inspect the site of a suicide car bombing at Surkh Rud district in Nangarhar province, east of Kabul, Afghanistan, Dec. 7, 2015. The United Nations said Sunday Afghan hostilities left more than 3,500 civilians dead and nearly 7,500 others wounded in 2015, an increase of four percent in civilian casualties from the previous year. The U.N. Assistance Mission in Afghanistan (UNAMA) said the number of civilian casualties during 2015 were the highest recorded since it began its systematic documentation of civilian casualties in 2009. UNAMA said increased ground fighting in and around populated areas, along with suicide and other attacks in major cities were the main causes of conflict-related civilian deaths and injuries in 2015. The report, however, documented a 10 percent reduction in civilian casualties from Taliban attacks. “Anti-Government Elements continued to cause the most harm – 62 percent of all civilian casualties – despite a 10 percent reduction from 2014 in the total civilian casualties resulting from their attacks,” it said. 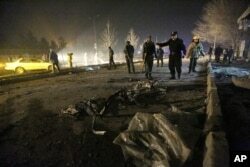 FILE - Afghan security forces inspect the site of a suicide attack near the Russian embassy in Kabul, Afghanistan, Jan. 20, 2016. Despite the drop in civilian deaths caused by the Taliban in 2015, there were more civilian deaths caused by pro-government security forces during ground fighting and attacks by aircraft, according to the U.N. report. “Pro-government forces caused 1,854 civilian casualties. While this accounts for 17 percent of the total, it all represents a 28 percent increase compared to 2014,” said Danielle Bell, UNAMA Director of Human Rights. UNAMA Chief Nicholas Haysom told reporters in Kabul the report has been shared with all parties to the conflict before its publication, including Afghan security forces and the Taliban. “Our objective is not simply to shame and blame, but to effect real changes in the practices of the parties to the conflict… because our primary objective is to change what happens on the battlefield,” he said. The report also documented a 37 percent increase in women casualties and a 14 percent increase in child casualties. “In 2015, the conflict caused extreme harm to the civilian population, with particularly appalling consequences for children. Unprecedented numbers of children were needlessly killed and injured last year – one in four casualties in 2015 was a child,” said Bell. The statistics and percentages contained in the report don’t really reflect and capture the real horror and the impact of the bombs, the improvised explosive devices (IEDs) and the the indirect fire on civilian communities, said Haysom. He again called on all the parties engaged in the Afghan conflict to uphold their public commitments and take every step to avoid harm to civilians. In this undated photograph released by Doctors Without Borders (MSF) on Oct. 3, 2015, Afghan MSF medical personnel treat civilians injured following an offensive against Taliban militants by Afghan and coalition forces at the MSF hospital in Kunduz. 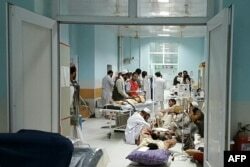 Sunday's report cited a deadly U.S. airstrike in October on a Doctors Without Borders (MSF) hospital in northern Afghanistan for largely contributing to the 9-percent rise in civilian causalities caused by international military forces in 2015. The air raid in the strategically important city of Kunduz killed 42 staff, patients and family members, and wounded another 43. The provincial capital was at the time briefly overrun by the Taliban. The UNAMA report called for conducting an "independent, impartial, transparent and effective investigation of the attack against the MSF hospital and make the findings public. Ensure accountability for those responsible." The Taliban has rejected the UNAMA report, alleging in the past two weeks alone Afghan security forces and their foreign partners have killed hundreds of people in northern Baghran province. “Civilian casualties can never be prevented with such injustice rather it only encourages irresponsibility of stooge Kabul administration and their masters in this regard,” the militant group said. Afghan President Ashraf Ghani’s office in a detailed written response to the report has acknowledged UNAMA’s efforts to highlight civilian suffering in the country but insisted the findings did not present the full picture of casualties the Taliban and their affiliate groups have inflicted on Afghan civilians in 2015.